The North Korean Air Force flew Yak 9 fighters in 1950 during the Korean War, however by then they were outdated and easily destroyed by more modern American planes. 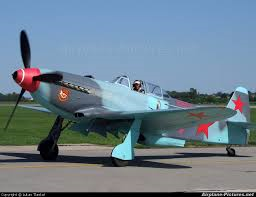 The Yak9 had entered service with the Soviet Air Force in 1942. It was armed with a 20 millimetre cannon and 12.7 millimetre machine gun. It had a fuel capacity of 400 litres which gave the plane a ranger of 875 kilometres.